Growing up bored in Muncie I got my first tattoo around age 13, a crude stick and poke made by hand. That tattoo didn’t stick around but the first professional one I received at age 17 did and undoubtedly started me on the path to become a Tattooist. In 2008 I graduated from Ball State University with a BFA in Fine Art and Creative Writing having worked various art handling, installation, and exhibition jobs in galleries and museums along the way. 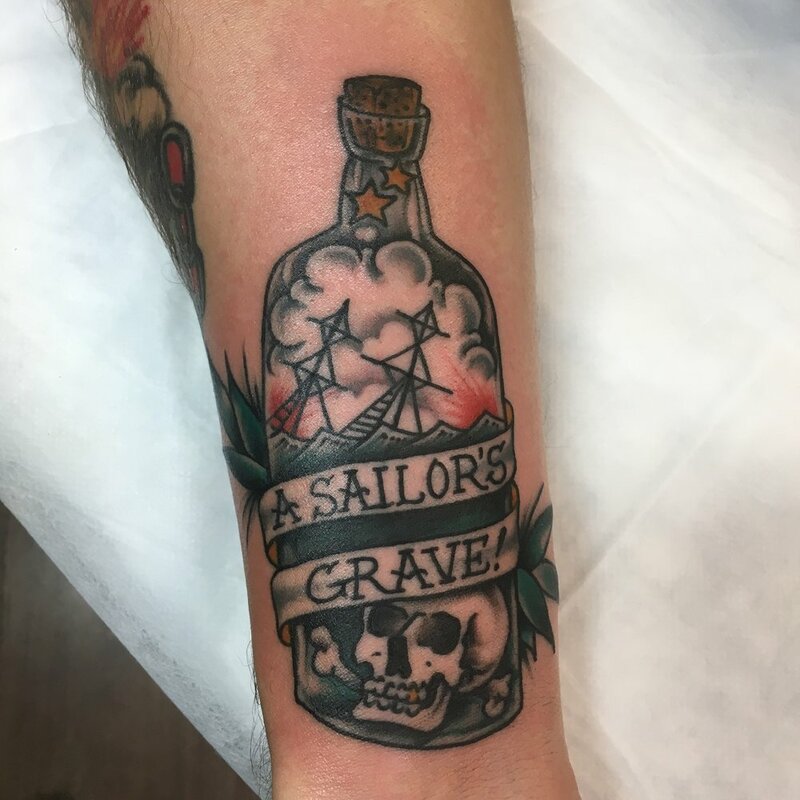 In late 2009 while working for Apple Computers I was lucky enough to get my foot in the door to tattooing with the crew at Lucky Rabbit including Craig Mathis who would become one of my most influential mentors. During my time at L.R. I absorbed all the knowledge about tattooing I could from Craig and Dan and learned the ins and outs of the business from piercer/shop manager, Jay Williams. In 2012 I moved to Bloomington Indiana to work alongside and learn from Dave Herr and Shannon Simpson at Genuine Tattoo Company, a fantastic walk-in shop stacked full of amazing old tattoo flash and lots of characters. 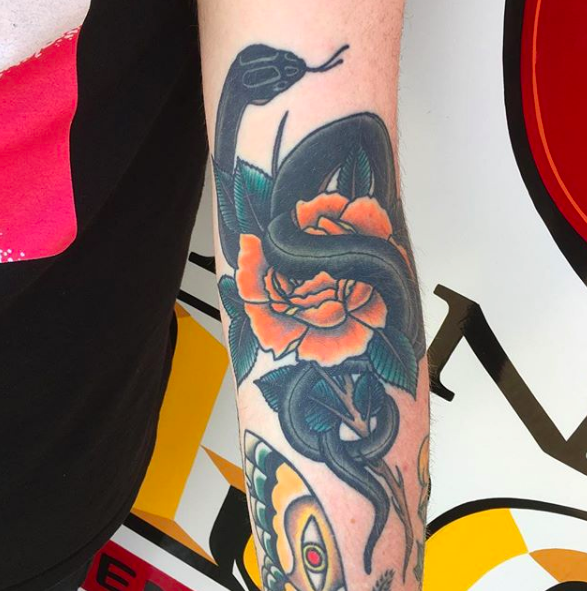 It was here that I remained until early 2015 when I returned to Muncie and began working with Sean King at Black Sword Alliance Tattoo and also where I met my partner, fellow Tattooist, Samantha Leyes. In early 2016 Black Sword Alliance relocated from it's old location on the corner of Broadway and Princeton to it's current location on McGalliard Rd giving me the opportunity to help build the shop I would ultimately become co-owner of. Just a few months after relocating the shop, then owner, Sean King, relocated to Oregon and sold the shop to myself, Samantha, Aaron Roberts, and Jay Williams. 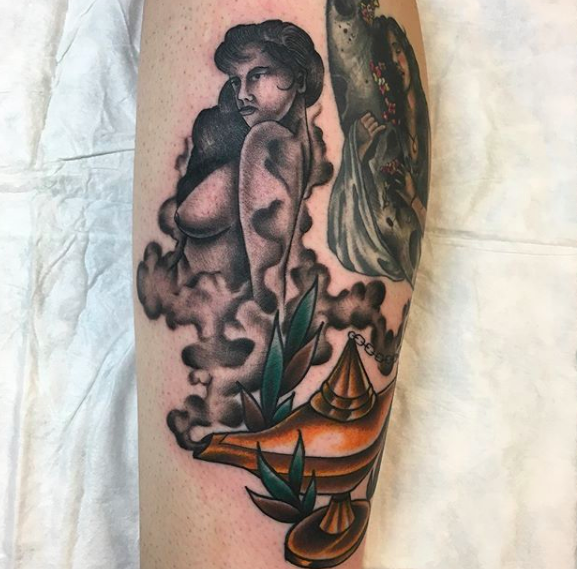 I am rooted in traditional americana, folk, and illustrative tattoos and art but I also enjoy traditional black and grey realism and the mixing of these styles. To view my complete portfolio including tattoos, tattoo flash, art, writing, and to stay up-to-date on upcoming art exhibitions, tattoo conventions and guest spots, and other happenings, please visit MuncieTattoo.com. To book an appointment please email me at MuncieTattoo@gmail.com or choose a time-slot that fits your budget from my calendar below to start the booking process. Please note that all appointments must be confirmed by me and are subject to time and price changes once all information about your tattoo is gathered.